This issue’s article is the Foreword, written by Dr. L.M. Singhvi, M.P. (formerly High Commissioner for India in the UK. ), to the recently published Vedic Mathematics course “The Cosmic Calculator” by Kenneth Williams and Mark Gaskell. Mathematics is universally regarded as the science of all sciences and "the priestess of definiteness and clarity". J .F. Herbert acknowledges that "everything that the greatest minds of all times have accomplished towards the comprehension of forms by means of concepts is gathered into one great science, Mathematics". In India's intellectual history and no less in the intellectual history of other civilisations, Mathematics stands forth as that which unites and mediates between Man and Nature, inner and outer world, thought and perception. Indian Mathematics belongs not only to an hoary antiquity but is a living discipline with a potential for manifold modem applications. It takes its inspiration from the pioneering, though unfinished work of the late Bharati Krishna Tirthaji, a former Sankaracharya of Puri of revered memory who reconstructed a unique system on the basis of ancient Indian tradition of mathematics. 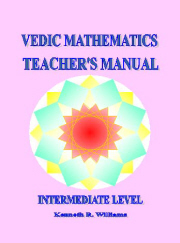 British teachers have prepared textbooks of Vedic Mathematics for British Schools. Vedic mathematics is thus a bridge across centuries, civilisations, linguistic barriers and national frontiers. Vedic mathematics is not only a sophisticated pedagogic and research tool but also an introduction to an ancient civilisation. It takes us back to many millennia of India's mathematical heritage. Rooted in the ancient Vedic sources which heralded the dawn of human history and illumined by their erudite exegesis, India's intellectual, scientific and aesthetic vitality blossomed and triumphed not only in philosophy, physics, astronomy, ecology and performing arts but also in geometry, algebra and arithmetic. Indian mathematicians gave the world the numerals now in universal use. The crowning glory of Indian mathematics was the invention of zero and the introduction of decimal notation without which mathematics as a scientific discipline could not have made much headway. It is noteworthy that the ancient Greeks and Romans did not have the decimal notation and, therefore, did not make much progress in the numerical sciences. The Arabs first learnt the decimal notation from Indians and introduced it into Europe. The renowned Arabic scholar, Alberuni or Abu Raihan, who was born in 973 A.D. and travelled to India, testified that the Indian attainments in mathematics were unrivalled and unsurpassed. In keeping with that ingrained tradition of mathematics in India, S. Ramanujan, "the man who knew infinity", the genius who was one of the greatest mathematicians of our time and the mystic for whom "a mathematical equation had a meaning because it expressed a thought of God", blazed new mathematical trails in Cambridge University in the second decade of the twentieth century even though he did not himself possess a university degree. I do not wish to claim for Vedic Mathematics as we know it today the status of a discipline which has perfect answers to every problem. I do however question those who mindlessly deride the very idea and nomenclature of Vedic mathematics and regard it as an anathema. They are obviously affiliated to ideological prejudice and their ignorance is matched only by their arrogance. Their mindset were bequeathed to them by Macaulay who knew next to nothing of India's scientific and cultural heritage. They suffer from an incurable lack of self-esteem coupled with an irrational and obscurantist unwillingness to celebrate the glory of Indian achievements in the disciplines of mathematics, astronomy, architecture, town planning, physics, philosophy, metaphysics, metallurgy, botany and medicine. They are as conceited and dogmatic in rejecting Vedic Mathematics as those who naively attribute every single invention and discovery in human history to our ancestors of antiquity. Let us reinstate reasons as well as intuition and let us give a fair chance to the valuable insights of the past. Let us use that precious knowledge as a building block. To the detractors of Vedic Mathematics I would like to make a plea for sanity, objectivity and balance. They do not have to abuse or disown the past in order to praise the present. Readers are probably aware that Sri Bharati Krsna Tirthaji, who reconstructed the system of Vedic Mathematics from the Vedas wrote sixteen books which were lost. A project is being organised to try to locate these lost volumes. The books if found would be a real treasure that could transform our understanding of mathematics. If you might be interested in contributing to a fund that could offer a financial incentive to anyone giving information leading to the recovery of the books, or if you know of anyone or any organisation that might be interested, please let us know at . The intention is that contributors to the fund would receive an immediate copy of the books when located. Mrs Curianni Thomas, a maths teacher at a gymnasium school in Wiesbaden, Germany would like to contact other VM teachers or scholars in Germany. She would like to teach the whole VM system. Please make contact with her through the newsletter: . We are considering having a page on the website: www.vedicmaths.org listing VM tutors around the world. If you would like to be included in such a list please send us an email detailing where you are, what level etc you teach, your experience/qualifications, contact details and so on. We may also be able to include a photograph of yourself. Only yesterday, July 17th 2002 the Times of India have published my extensive interview in the form of Q & A column on page 14; in the interview they have given quite a good space to VM; I'd request everybody interested to access www.timesofindia & read the column. This interview is on EDIT page which is published in all the Editions of TOI. It is generally believed that the total readership is likely to be 5 million. I have already received so many telephone calls & still getting them. The interview also announces World Academy of Vedic Maths. Recently Mumbai & Pune branches of Motilal Banarsidass conducted a series of Vedic Mathematics Workshops in S.N.D.T Collage, Bhawan's Collage, Tolani Collage,Centrals School & at Zavier Institute of Management & many more Places at Mumbai. Nearly 2000 Participants had Attained the Workshops in Mumbai in about 15 Workshops. In Pune at Central School, ST.Clace School, Bharatiya Vidhya Bhawan school, Gurukul School, Crossword Book shop, Bal Vikas, Information & Technology Institute Baramati, & at Sanas Plaza for two days. Nearly 2500 participants had attained in nearly 15 Workshops. Nearly all Newspapers in Pune & Mumbai covered the News. Times of India Mumbai & Pune Edition had covered regularly 4/5 times. We are getting several calls every day in Mumbai & Pune for more Workshops & seeing the response we are planning to arrange more Workshops. All these 7 days workshop in Mumbai & 8 days workshop in Pune is arrange to celebrate our 100th Anniversary. Experts & scholars Mr.Manish Soni from Baroda, Dr. Abhijit Dass, Mrs. Rajeswari Sharma, Mr. Chandra Has, Dr. B.N.Naik from Mumbai have taken the classes. In all we get a very good response from all sectors of the workshop. All these Events & Workshops had arranged under guidance of Sri. R.P.Jain with full co-operation. This method is from Sathya Narayanan Nadumana, an Accountant by profession working with United Arab Shipping Company, Dubai, though he is from South west India. So if you found any wrong results please let me know.